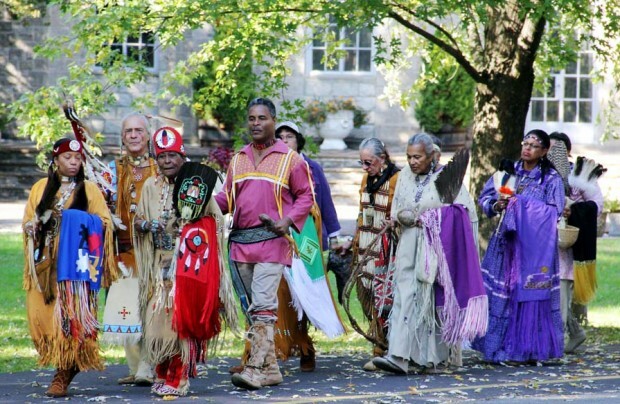 Native Americans from the Kateri Ciricle group walk in procession before Mass at the motherhouse of the Sisters of the Blessed Sacrament, Bensalem. There may have been showers on Rome on Sunday, Oct. 21 where Pope Benedict XVI officially proclaimed seven new saints, but it was gorgeous in Bensalem, Pa.; you could even say Indian summer. That’s appropriate because among the new saints was Kateri Tekakwitha, North America’s first female Native American saint. It was quite a celebration at the motherhouse of Sisters of the Blessed Sacrament, where an overflow congregation attended the official Philadelphia celebration for this quintessential American saint who was born in 1656 in what is now Upper New York State and died in 1680 in Lower Canada. Present for the festive occasion were members of many nationalities and races, but most prominent were the large number of Native Americans, dressed in the distinctive ceremonial regalia of their tribe or band. There were actually about 25 different tribes represented, according to Chief Buffy Red Feather, who is herself Cherokee, and has been the voice of Catholic Native Americans in the Delaware Valley for decades. She is also the leader of the Philadelphia-based Lily of the Mohawks Kateri Circle, one of many such Circles nationwide that promote devotion to St. Kateri. The celebration began outdoors with the ceremonial Blessing of the Four Directions, followed by chants, drumming and of course, dancing, which is an integral part of Native American spirituality. “Kateri really is a patroness for diversity and we have people from China, Nigeria, African Americans here; she draws so many people together,” said Redemptorist Father Bruce Lewandowski, the archdiocesan Vicar for Cultural Diversity, who along with the Sisters of the Blessed Sacrament put the day’s program together. 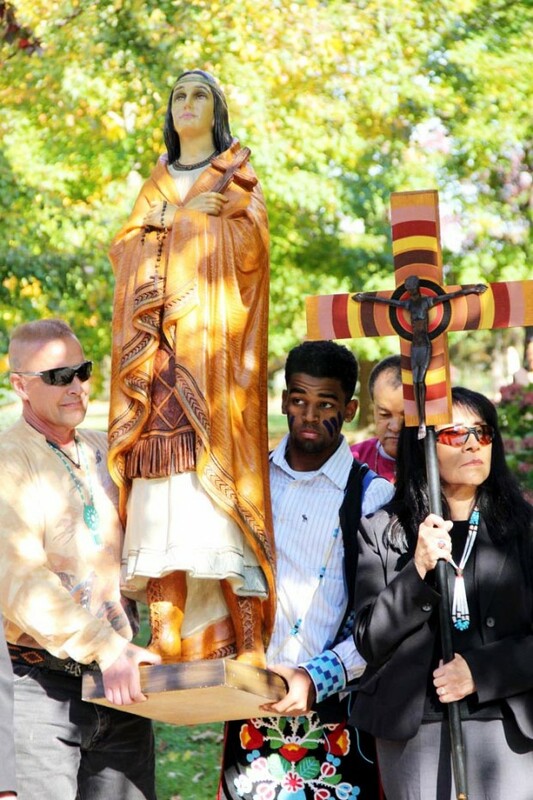 After the outdoor festivities, the gathering followed a life-sized statue of St. Kateri into the chapel where the festivities continued through joyful celebration of Mass. In the absence of Archbishop Chaput, who was in Rome for the canonization, the principal celebrant and homilist for the Mass was Capuchin Franciscan Father Thomas Betz, who was specifically chosen for this by the Native American community because of his long ministry to many groups including Native Americans. This inclusiveness was emphasized by Father Betz in his homily. “Catholic means universal,” he said. He also spoke of St. Kateri’s suffering over her short life, from the loss of her parents and brother to small pox, which left her disfigured for life, and her love for Christ that ultimately led to her leaving her tribe for a Christian community in Canada. The location for this celebration at the Blessed Sacrament Sisters’ Motherhouse was especially appropriate because the specific mission given to the sisters by their foundress, Mother Katharine Drexel, was ministry to Native and African Americans, another group well-represented at the ceremonies. Finally, at the invitation of Sister Patricia Suchalski, president of the Sisters of the Blessed Sacrament, the sacramental breaking of the bread was followed by a corporal breaking of the bread through the shared refreshments that followed the liturgy. Lou Baldwin is a freelance writer and a member of St. Leo Parish. Participants in the celebration for the canonization of St. Kateri Tekakwitha process with a statue of her before Mass.